NEW YORK (CNS) — A few flaws notwithstanding, “BlacKkKlansman” (Focus) represents an effective — and, strange as it may sound, often entertaining — look at the vicious racism lurking at the fringes of American life and perpetually aspiring to enter its mainstream. Since the film’s examination of the unsavory world of the Ku Klux Klan comes with a large dose of vulgar dialogue, however, not to mention a barrage of nasty epithets, it should generally be treated as fare fit only for grownups. Even so, some parents may consider its potentially formative impact on impressionable viewers sufficiently important to allow for patronage by older teens. Together with his script collaborators Charlie Wachtel, David Rabinowitz and Kevin Willmott, director and co-writer Spike Lee has a field day adapting Ron Stallworth’s 2014 memoir “Black Klansman” into a richly ironic, fact-based mix of drama and comedy. As stupid as they are sinister, the dopey bums who inhabit the cheaply wood-paneled dwellings and meeting places of the early 1970s Klan are easy targets for satire — even if a shiver or two should accompany the laughs. And the ease with which Stallworth, played appealingly by John David Washington, Denzel’s elder son, gained entree into their under-a-rock milieu adds to the humor as well as the wonderment. After becoming the first African-American police officer in Colorado Springs, Colorado, rookie Stallworth is assigned to infiltrate a lecture by ex-Black Panther Kwame Ture — born Stokely Carmichael — (Corey Hawkins). There he meets, and quickly falls for, Patrice Dumas (Laura Harrier), the militant head of the student group sponsoring the event. Back at the precinct, Stallworth spots an ad in the local paper inviting its readers to join the Klan. Casually, he dials the number provided and, before he knows it, is successfully impersonating a white racist. In a mistake that will come back to haunt him, though, Stallworth inadvertently uses his real name during the conversation. Invited to meet the leader of the area’s Klansmen, Walter Breachway (Ryan Eggold), Stallworth works with fellow officer Flip Zimmerman (Adam Driver) to develop a tag-team strategy: Stallworth will continue the phone masquerade, while Zimmerman will portray his fictional alter ego in the flesh. Soon, Zimmerman is hobnobbing not only with Breachway but with his more canny — and ever suspicious — subordinate, Felix Kendrickson (Jasper Paakkonen), as well as with half-witted hanger-on Ivanhoe (Paul Walter Hauser). Though repeatedly challenged by Kendrickson, Stallworth and Zimmerman perpetrate their ruse so adroitly that they eventually manage to hoodwink even the Klan’s Grand Wizard at the time, David Duke (Topher Grace). Zimmerman’s interaction with these unappealing figures leads him to question his past indifference toward his Jewish heritage and his willingness to “pass” as a gentile. Gentle, sensible Stallworth, meanwhile, finds himself caught between his dedication to his work and the radicalism of Dumas’ worldview which holds all “pigs” in contempt and rejects any notion of reforming the system from within. 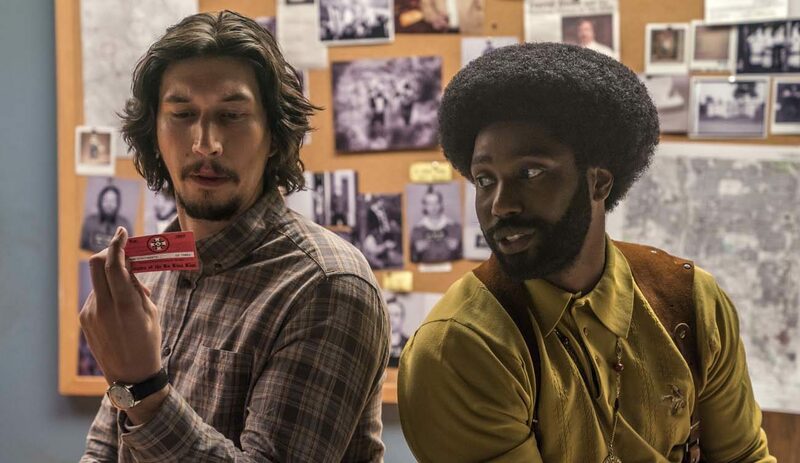 “BlacKkKlansman” would have benefited from less self-indulgent editing. Although set to an era-evoking evergreen, 1972’s “Too Late to Turn Back Now” by the Cornelius Brothers & Sister Rose, a scene in which Ron and Patrice share their first dance, for example, simply goes on too long. The upshot is a needlessly extended running time well in excess of two hours. In laying open the connections between the events of 40-plus years ago and the contemporary political scene, moreover, Lee uses a sledgehammer rather than a scalpel. Even supporters of President Donald J. Trump, however, will have to admit that his failure to decisively reject the support of the alt-right in general — and the older, but seemingly no wiser, real-life Duke in particular — leave him open to legitimate criticism. Violent content consists of a fatal but bloodless bombing attack as well as distressing footage of the hit-and-run incident during protests in Charlottesville, Virginia, in 2017 that cost the life of Heather Heyer. As for matters of sexual morality, though Ron and Patrice’s relationship is initially nonphysical, an exchange late in the movie suggests this is not going to be the case permanently, though the two are not yet planning to marry. Viewers of faith will be outraged to find that the rituals of the Klan involve sacrilegious prayer as well as the use of a form of holy water, dispensed by an aspergillum, the instrument used for the same purpose in Catholic liturgy. The film contains brief but sometimes disturbing scenes of violence, mature themes, including racial animus, about a dozen profanities and half as many milder oaths, pervasive rough and crude language, frequent racial slurs, fleeting sexual references and an obscene gesture. The Catholic News Service classification is A-III — adults. The Motion Picture Association of America rating is R — restricted. Under 17 requires accompanying parent or adult guardian.